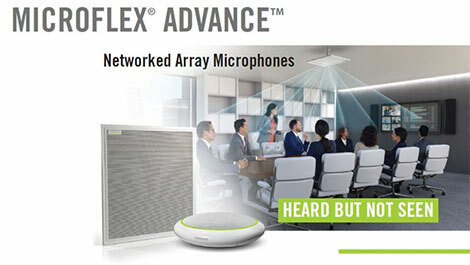 Shure has announced that the newest ceiling (MXA910) and table (MXA310) array microphones from its Microflex Advance series are shipping. Designed for meeting room environments, the microphones features Shure’s IntelliMix Digital Signal Processing Suite, offering Steerable Coverage technology allowing them to capture audio in any part of a meeting space. They also use the Dante Audio Networking protocol to manage all control, audio, and power signals carried through a single standard Ethernet cable connection. The MXA910 model can be flush-mounted in any standard ceiling tile grid, and can also be installed below the ceiling with standard VESA-D and wire hanging mounts. The MXA310 features a recently developed “toroid” polar pattern to reject unwanted artefacts from overhead (such as HVAC or projector fans). The MXA910 microphone’s Steerable Coverage technology enables up to eight lobes that are configurable in three dimensions. The technology allows the MXA310 to deploy up to four discrete audio channels around a table. The microphones have programmable capacitive-touch mute switches for ease of operation, and offer operators the ability to customise LED colour and shape to indicate microphone status.